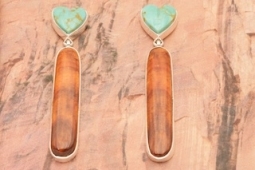 Beautiful Heart Earrings featuring Genuine King's Manassa Turquoise and Sponge Coral set in Sterling Silver. Post Earrings Designed by Santo Domino Artist Bernice Chavez. Signed by the artist.